By 2021, data center capacity in India is expected to increase up to 50%, providing customers with a wide choice of high-grade facilities at competitive rates. Gartner expects enterprise spending on data center services to grow from $1.5 billion in 2017 to $3.7 billion by 2022. Which is why it is imperative that your data center has the capacity to service your growing data needs. Sify has always taken pride in supporting such technology advancements since the launch of its first Enterprise Data Center in 2001. Gartner’s Market Guide tracks the evolution of Data Center Services Market in India and highlights the wider choice of providers, hosting locations and services, including colocation, managed cloud services and data center outsourcing. Gartner suggests that this trend is enabling enterprises to increase adoption, accelerating the growth trend in India and offers recommendations to businesses consuming Data Center services. Gartner acknowledges Sify as among the top data center service providers in India, providing end to end data center services such as Colocation, Virtual Private Cloud, Hosted Private Cloud, Managed Hosting and Cloud Services and Support for Hyperscale Cloud Providers. 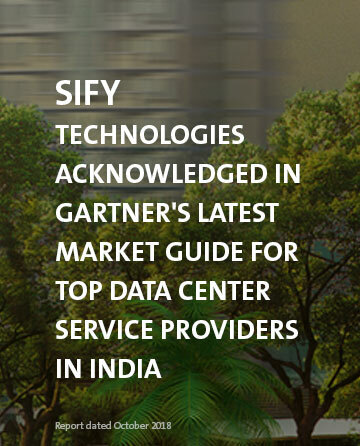 The Market Guide mentions that Sify Technologies has a good data center footprint, offering colocation, cloud and a good range of managed services. Download the full research report! Download Gartner’s Market Guide for Top Data Center Service Providers in India and learn more about what Data Centers can do for your organization. This content was published by Gartner, Inc. as part of a larger research document and should be evaluated in the context of the entire document. The Gartner document is available upon request from Sify. Gartner does not endorse any vendor, product or service depicted in its research publications, and does not advise technology users to select only those vendors with the highest ratings or other designation. Gartner research publications consist of the opinions of Gartner’s research organization and should not be construed as statements of fact. Gartner disclaims all warranties, expressed or implied, with respect to this research, including any warranties of merchantability or fitness for a particular purpose.